• Focused efforts produce results – Focusing our efforts to make sure the right kinds of services get to the people who need it most has been a goal of my administration, and we’re seeing results. Statewide, over 5,000 people have transitioned off the streets or maintained their housing — a more than 50 percent increase over last year. $12 million from the 2016 state Legislature is being deployed for health and human services, public safety, and data gathering — with half of the Housing First resources going to the neighbor islands. Gov. 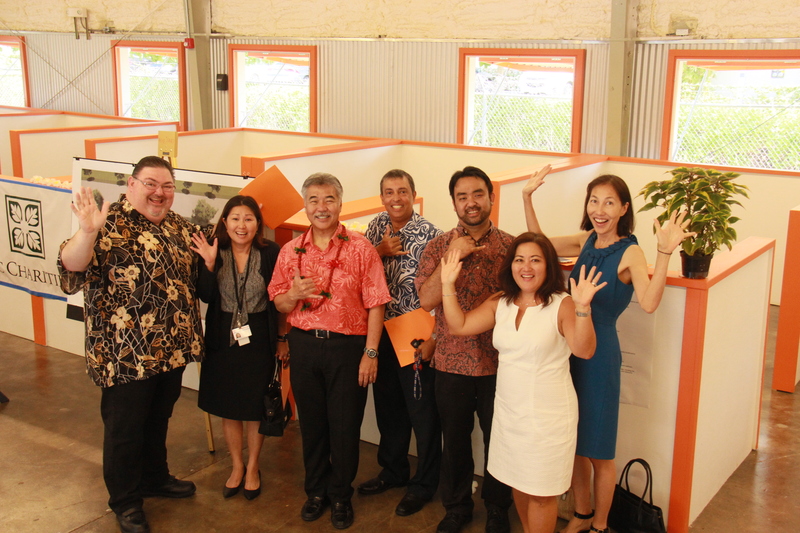 Ige, DHS director Pankaj Bhanot and state homelessness coordinator Scott Morishige with staff at the new Family Assessment Center in Kaka’ako. • Kaka‘ako homeless population reduced – More than 290 homeless people from the area were placed into shelters or housing. A new Family Assessment Center, focused on homeless families with children, opened in September 2016 and is connecting families to housing and other services in 90 days or less. The first family was placed into permanent housing in 21 days. • First Landlord Summits held – A new partnership between the Hawai‘i Association of Realtors and the governor’s office is encouraging apartment owners to rent to low-income families and those who are homeless. • More public housing units available – A new “extreme makeover,” multi-skilled team approach is renovating public housing units faster.